Property Location Located in New York (East Village - Lower East Side), Leon Hotel is minutes from Eldridge Street Synagogue and Museum of Chinese in Americas. 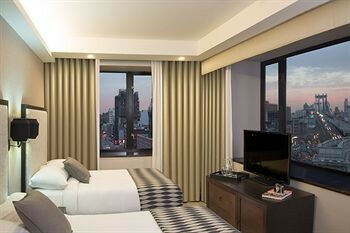 This hotel is close to Brooklyn Bridge and New York University.Rooms Make yourself at home in one of the 40 air-conditioned rooms featuring iPod docking stations and flat-screen televisions. Complimentary wireless Internet access keeps you connected, and cable programming is available for your entertainment. Bathrooms have shower/tub combinations and hair dryers. Conveniences include safes and coffee/tea makers, and you can also request cribs/infant beds.Rec, Spa, Premium Amenities Make use of convenient amenities, which include complimentary wireless Internet access and tour/ticket assistance.Business, Other Amenities Featured amenities include a 24-hour business center, limo/town car service, and dry cleaning/laundry services.